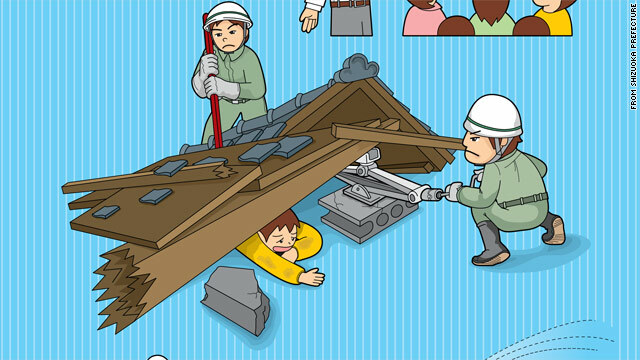 An image from Shizuoka Prefecture's guidebook to prepare for the "Great Tokai Earthquake." It's called the "Great Tokai Earthquake" - a predicted disaster southwest of Tokyo that Japan has spent trillions of yen preparing for, based on the inexact science of predicting earthquakes. But Friday's 8.9-magnitude quake happened in a completely different subduction zone - where two oceanic plates collide. So is Japan still at risk for another great quake? Since 1976, the quake-prone country has warned its citizens about the possibility of an 8.0 quake off the coast of Shizuoka prefecture, located about 100 miles (160 km) southeast of Tokyo. Friday's quake was centered offshore some 230 miles (373 km) northeast of Toyko. Japan's government has even provided a 14-page guidebook on the Tokai earthquake theory - which warns, "It would not be surprising if a huge earthquake happened tomorrow" - and how to prepare for it. It's all based on the fact that there hasn't been a major quake along an area between the two plates that collide off Shizuoka's coastline in over 150 years. That means a lot of energy has built up and will eventually release in an earthquake. While scientists can be very certain where a quake will occur, they cannot predict when such events will happen - particularly in Japan. "The tectonics of Japan are very complicated because they have three plates coming together beneath that country: the North American plate to the west, the Eurasian plate to the east, and the Philippine plate somewhat to the southeast," said research geophysicist Morgan Moschetti with the National Earthquake Information Center. "Generally we can give ideas where this will happen based on (history) … but ... we can't predict the times of earthquakes." That's not to say they can't predict that a great quake will trigger numerous aftershocks. Moschetti said the aftershocks resulting from Friday's event "will continue for a long time." The release of energy from Friday's event - which happened along the subduction zone between the Eurasian and North American plates - will have have no effect on alleviating the pressure building up between Eurasian and Philippine plates, where the Great Tokai quake is predicted to happen. So after Japan picks up the pieces from this disaster, it will have to start preparing for what could be another one. This so called experts are full of crap, every time we have an earthquake they talk about a bigger earthquake... " you don't know sh!t!!! anyone heard of the pole shift? a second sun? planet X? no place is gonna be safe.... we are gonna see more things happening. "There are three things which build and maintain civilization throughout time: pure air, pure water, and pure food. And as an eternal truth I say unto you, that there are three things which bring the end of civilization, even the mightiest that have ever been and shall ever be, from the beginning-less beginning to the endless end of all time: impure air, impure water, and impure food." – Zenda Avesta, c. 3000 BC.